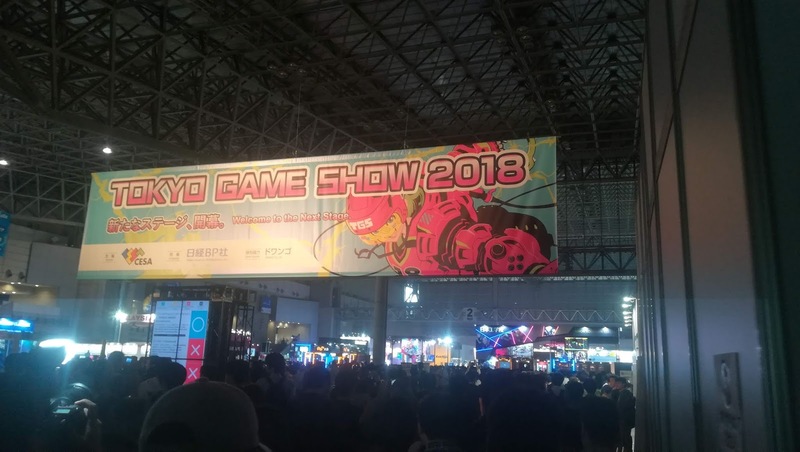 On Saturday, September 22nd, I joined the flood of eager game fans attending the first Public Day of the 2018 Tokyo Game Show. 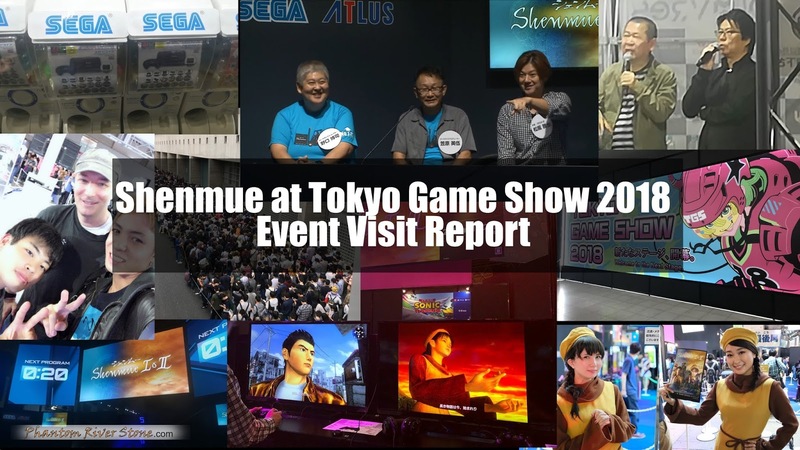 Information about the event in the days leading up to it indicated an exciting amount of Shenmue-related content, including a panel discussion, SEGA merchandise including a new official Shenmue T-shirt, and a hands-on play area at the SEGA booth for Shenmue I & II. 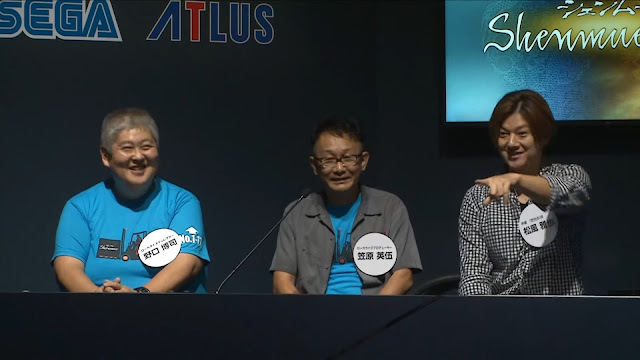 Yu Suzuki himself had even made a surprise on-stage appearance during the Business Days. Here is a report on everything Shenmue I encountered on my visit. The day that dawned was gray and drab, with the smell of possible rain in the air. The event venue, as usual, was in Chiba prefecture at the sprawling Makuhari Messe convention center, so my alarm clock was set even earlier than Ryo's usual waking time for departing on the hour-and-a-half train journey. Upon arrival at the convention center's train station, kitted out in my vintage Shenmue T-shirt I joined the flow of passengers heading in a single direction - no need to consult a map! And, as expected, the end of a long line of people winding around the buildings soon came into view, and the wait for entry began. Along the way, one of the most well-known of Shenmue symbols offered encouragement. Then, at last, the line began moving forward at a noticeably faster pace, and at last I was inside the event hall. The venue consisted of several huge interconnected hangar spaces, and from the entrance I could see it was already thronging with attendees, an intense mix of sounds and lighting assailing the senses. The sight that greets you at the entrance to the Tokyo Game Show. My first port of call was the SEGA stage area, where the Shenmue panel discussion was to be held (following a preview of Hitman 2 which was coming to an end), and I was able to find a spot in the audience close to the stage. Shortly before the scheduled starting time, the familiar tones of Departure on a New Journey started to play through the speakers. Approximately 50 or so spectators were gathered close to the stage for the event, which was also live-streamed, and it could also be viewed and heard by anyone passing near the SEGA area. Then the display monitors changed to the Shenmue I & II logo, and a 30-second countdown commenced. The panel session was about to begin! After introducing the four panelists from the Japanese press - who are also fans of Shenmue - Masaya Matsukaze himself was welcomed onto the stage (who is not only the Japanese voice of Ryo Hazuki in the Shenmue games but also the motion capture actor for all his movements). 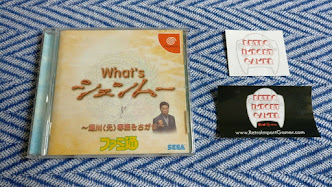 Accompanying Matsukaze-san were two members of the original development project team for both Shenmue games: Eigo Kasahara was Planning Director, and Hiroshi Noguchi was in charge of designing the real-time movie cut scenes (Kasahara-san was also in charge of creating the Shenmue Passport disc). These two gentlemen have been working on the Japanese release of Shenmue I & II as Localization Producer and Director, respectively. Noguchi-san and Kasahara-san were both sporting the new Shenmue forklift T-shirt. Matsukaze-san waved and interacted with the fans, reacting happily when he noticed someone in the audience wearing a Shenmue T-shirt. Masaya Matuskaze (right) reacts as he notices someone wearing a Shenmue T-shirt. Next to him are Eigo Kasahara (center) and Hiroshi Noguchi (left). The discussion took the form of the panelists sharing their own memories and thoughts about what makes the Shenmue games great, with comments from Matsukaze-san and the others from time to time. Dominating much of the discussion was the enthusiastic talk by IGN Japan's Esra Krabbe for the games. In recognition of this he was selected as the "Shenmue Respect Champion" (and being presented with a sash!) and challenged to win first place in Shenmue's forklift race - which he succeeded doing admirably. 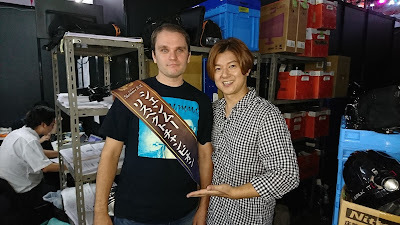 IGN Japan's Esra Krabbe (wearing his "Shenmue Respect Champion" sash) backstage with Matsukaze-san. Photo: Esra Krabbe via Twitter. A highlight was Matsukaze-san's "fan service" reenactment of his line from the opening scene of Shenmue: "Oyaji? Oyajiiiiiiii!" ("Father? No!!!!!"). He also revealed that when he recorded this scene back at the young age of 20 years old, he had to cradle the neck of the famous actor Hiroshi Fukioka (who played Iwao Hazuki) many times over for the purposes of motion capture. 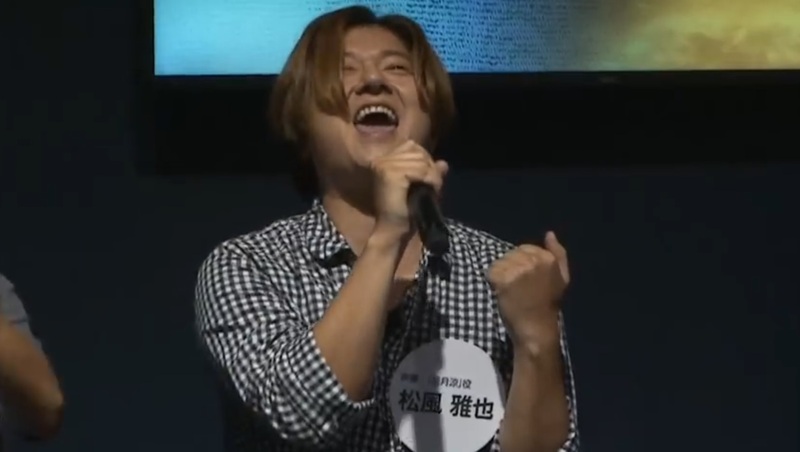 Matsukaze-san performs the iconic "Oyajiiiiiii!" ("Nooooooooo!") from the opening of Shenmue 1. The 30-minute timeslot was alas over far to quickly. Matsukaze-san later wrote on Twitter [Japanese] that he would love to spend more time speaking about Shenmue if someone, perhaps on an interview program - I hope someone takes him up on his suggestion! After the panel discussion had ended, the on-stage participants disappeared backstage without any chance for interaction. I spent a while walking around the SEGA area, which held a number of display booths. As I came to the hands-on play section, I spotted Kasahara-san and Noguchi-san walking along and took the chance to go up and say hello. After thanking them for the on-stage panel discussion and some quick chat, I asked what their localization roles for Shenmue I & II involved. 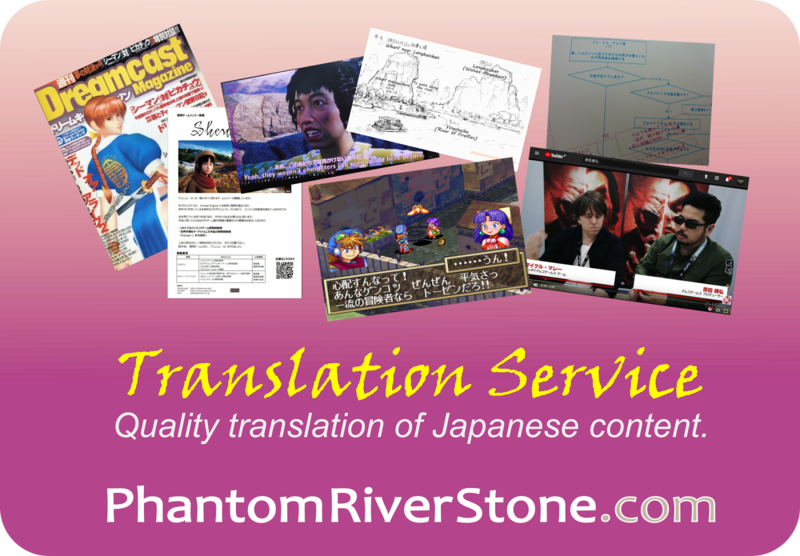 At a high level, Kashara-san explained that the overseas-developed version was their starting point, and they worked with this to produce the Japanese domestic release. (I imagine this would have covered various aspects such as menus, creation of higher-resolution or modified textures, re-recording of Japanese dialogue due to the removal of brand names and so on). They were obviously just wanting to enjoy the show, so I didn't want to keep them long, but it was nice to be able to meet two of the legendary staff behind the original games. 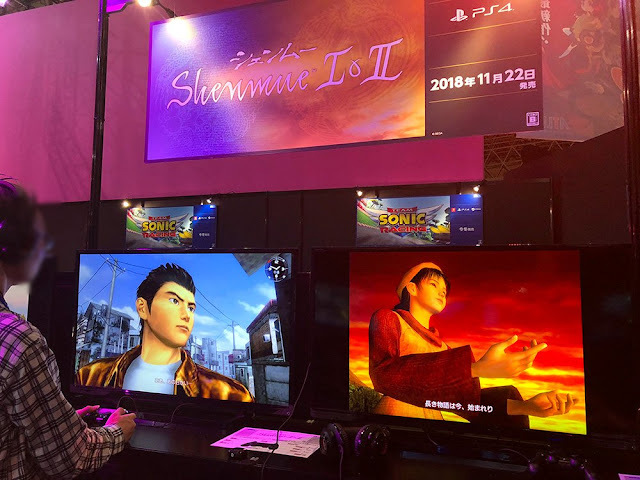 A large Shenmue banner was among those suspended above the hands-on play area, which featured a number of games that could be tried. The Shenmue I & II banner hanging proudly. Players of Shenmue I & II were able to freely play the very beginning of the game, with a 15-minute time limit. However the wait time was around 40 minutes, so I decided to come back to it later. 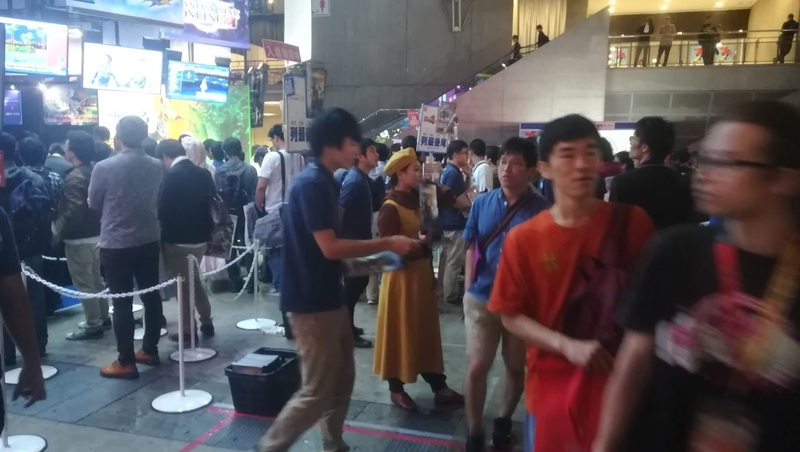 Standing in front of the play area was Shenhua herself, handing out the official Shenmue Sacred Spot Guide Map of Yokosuka. Shenhua, outside of her normal rustic environment. 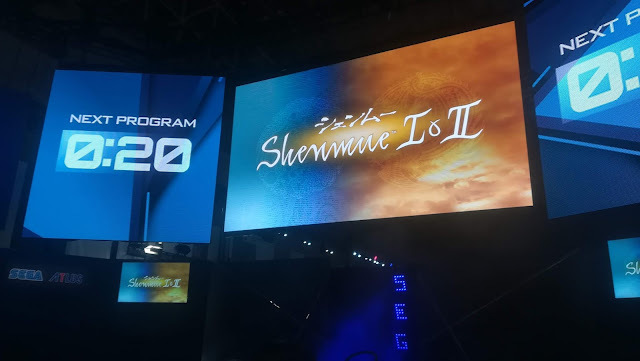 A side-note of interest is that over the course of TGS there were actually two "Shenhua"s, appearing on different days. Shenhua and... Shenhua? (The Shenhua present on the day I visited is the one on the right). 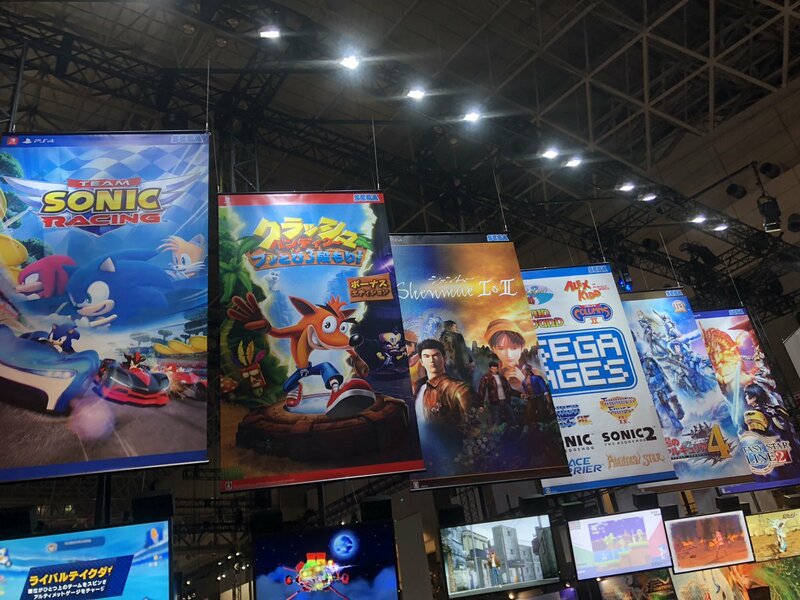 I wanted to find the SEGA merchandise stall next, which was located in a completely different hall. Due to the bustling crowds filling the halls, it took five minutes to reach my new destination, and I was greeted with a sign indicating a 45-minute queue for purchases. I used this time to fill out my order form, trying not to ignore the screen that flashed up the catalog numbers of items that had sold out for the day. 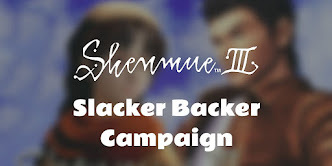 Fortunately, the Shenmue T-shirt remained available! 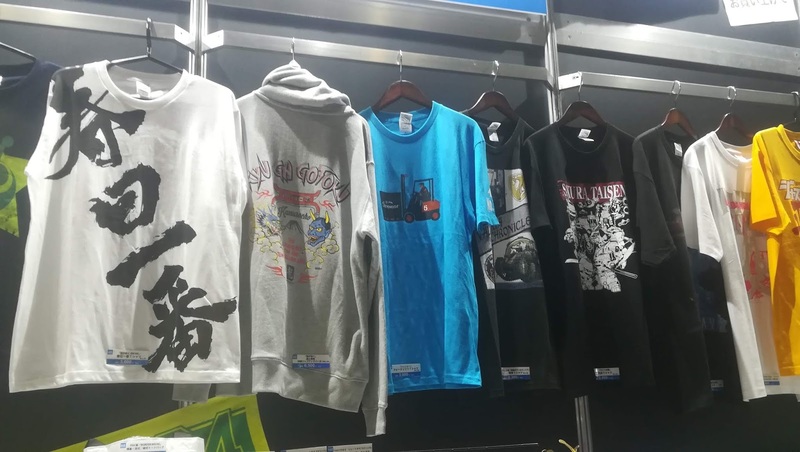 The new-release Shenmue T-shirt (center) with a picture of Ryo driving a forklift. 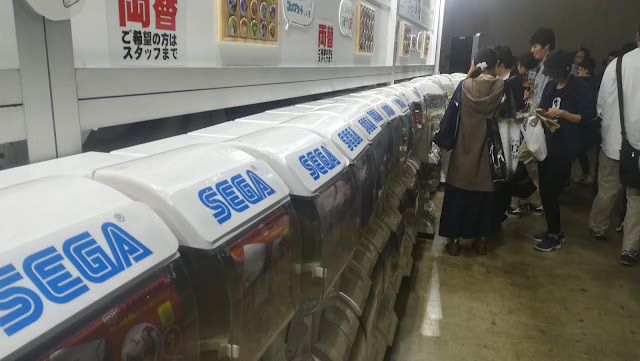 No visit to the SEGA stall would be complete without a turn at the capsule toy machines, which were lined up in double stacks along the back wall of the stall. Capsule toy machines, waiting to gobble up three of your 100 yen coins. Wandering away from the SEGA stand, my eye was caught by an array of high-tech virtual-reality motorcycles, behind which was a stage with a presentation in progress. That's when I noticed a familiar-looking figure on the stage (wearing a familiar striped t-shirt) - it was Yu Suzuki at the JPPVR stage! He had brought along with him Shenmue III animation producer Hiroaki Takeuchi. I quickly joined the audience, delighted to be able to see Yu Suzuki live for the first time. While his main purpose was to talk about his involvement as general producer for a new JPPVR game called VRSUS, Yu also took some time to speak about Shenmue III, as well as playing the recent trailer. Takeuchi-san also related that Yu was now spending almost all his time at the YS Net studio, and sleeping over there. (We will be covering the content of Yu's talk in a future post). 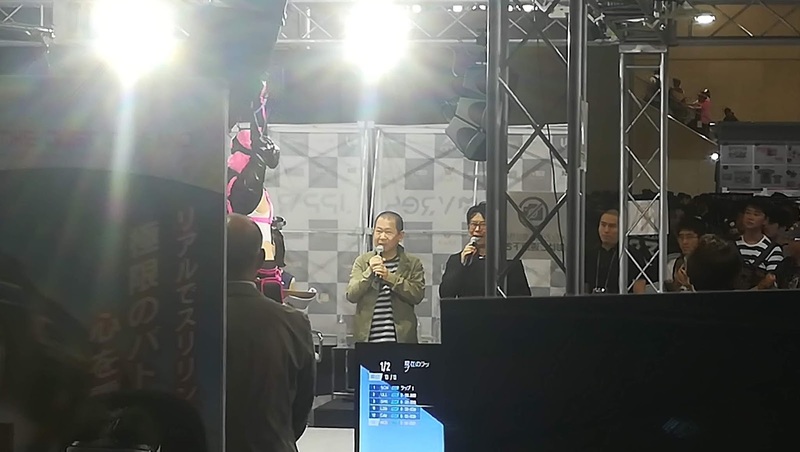 Yu Suzuki and Hiroaki Takeuchi on the JPPVR stage. After the stage presentation had ended (alas, Yu Suzuki did not stay to talk with the public, although this is understandable), I had the pleasure of meeting up with a Japanese Shenmue fan who runs a very active Shenmue Twitter account. The rest of the day was spent exploring the show, checking out the numerous stands and soaking up the incredible atmosphere of the event. With another 1.5 hour train ride back home, my legs were certainly feeling it at the end of the day, but it was amazing to have been able to be part of the experience. In coming posts I plan to cover in more depth some of the Shenmue content of the various interviews and on-stage presentations. As always, keep an eye on the blog! Fantastic write up dude! Wish i could have attended, it sounded like a blast :)! Everything seemed to work out rather perfect for you throughout the day, and you’ve also been within a few metres of the great man himself 😍!